Holborn BSAC run a range of courses throughout the year. 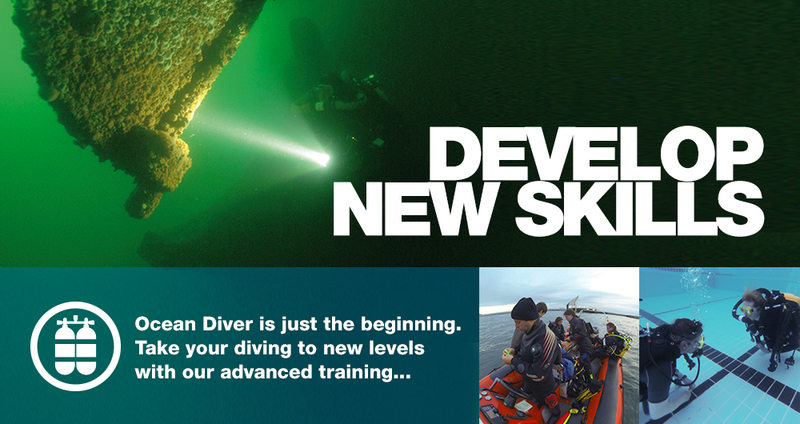 These courses include the next levels of BSAC Diver Grades beyond Ocean Diver, as well as specialist Skills Development Courses (SDCs), all designed to broaden your knowledge. In addition Holborn BSAC also offers a number of unique club courses, such as underwater photography, rebreather try-dive sessions and ropework, to name a few. All of these courses are available to club members, including those who have dive qualifications from other training agencies. The British Sub-Aqua Club has been teaching scuba diving since the early 1950s. During this time the Diver Training Programme has been regularly updated and improved to keep pace with developments in equipment and diving knowledge. The programme is designed to build confidence and self-reliance, whilst keeping safety uppermost. Following on from Ocean Diver the next core grades are Sport Diver, Dive Leader and Advanced Diver. Each qualification builds upon the skills learnt in the previous grade as well as introducing new ones. As you advance through the core diving grades, the depth to which you are permitted to dive increases, putting more and more dive sites within your reach. You will also learn the skills required to undertake dives requiring mandatory decompression stops, as well as more advanced rescue techniques. Everything, in fact, to make you a more complete and highly competent diver. As well as the core diver grade qualifications Holborn also runs many of the Skill Development Courses (SDCs) that are offered by the BSAC. SDCs are an excellent way of expanding your understanding of the broader diving environment and the skills required to support diving operations. Whether your interest is in wreck diving, small boat handling, rescue, marine life or technical, there is an SDC to suit – many of which are run by Holborn. These include Lifesaver, Boat Handling, Oxygen Administration, Search and Recovery, Nitrox and Chartwork and Position Fixing. While SDCs are useful, they don’t cover every aspect of diving. For this reason Holborn offers a range of in-branch courses that cover other areas of interest. These one-off courses usually take the form of evening sessions and are both informal and informative. Club courses include; Underwater Photography, Rebreather try-dives, Ropework, Equipment maintenance and Instructor workshops. If you would like to find out more about the courses than Holborn run, please feel free to get in touch either via our contact section or by clicking on the button below. £72.00: fee includes cost of the training pack (£93.00 for crossover from other training agencies). In addition there may be other fees associated with the open water dives required to complete the qualification such as dive fees, accommodation, entry to inland sites etc. Where possible these costs will be determined prior to the start of the course. As a BSAC Dive Leader you are are becoming an expert in your field of dive leadership. You will also be competent in planning dives for groups of divers and managing diving on the day including, if necessary, managing rescue situations. This comprehensive course is a mix of classroom-based and practical lessons that will give divers confidence to plan, lead and manage dives, and deal with emergencies. Leading a dive will develop enjoyment, confidence and experience as a diver. After qualfying, and if you wish, depth can be built progressively to a maximum of 50m. Dive Leaders are eligible to progress to Open Water Instructor. You will learn dive leadership skills through 12 classroom lessons, seven open water dives, two dry practical lessons and 20 dives (which may include the open water lessons) in a range of conditions. The BSAC Dive Leader course covers the role of the BSAC Dive Leader, Dive Planning and Management, Delayed Surface Marker Buoy (DSMB) use (midwater deployment), dive leading demonstrations, basic life support with Oxygen administration and practical management of diving incidents, casualty assessment, dive planning, shot recovery by simple lift and review of rescue skills. £65.00: fee includes cost of the training pack. £55.00: fee includes cost of the training pack. This award is open to anyone over the age of 12 and an Ocean Diver (or acceptable alternative). Additional training prior to the examination may be necessary and this can be delivered in the branch or centre prior to assessment. As there is a maximum of three students per instructor, there’s lots of hands-on action with this course. You’ll feel the thrill of driving a boat at high speed, and face the challenge of conquering new skills and techniques. When you’re not driving yourself you’ll be practicing new skills as part of the boat crew. £200.00: fee includes cost of the training and assessment pack and exam. In addition there may be other fees associated with the practical elements required to complete the qualification such as transport to/from practical sessions. Where possible these costs will be determined prior to the start of the course. You need to be a minimum of BSAC Ocean Diver (or equivalent). This course may also be open to others at the discretion of the BSAC Safety and Rescue Skills Chief Examiner. £25.00: fee includes cost of the training pack. This two-day course teaches divers how to use the correct techniques and procedures required for search and recovery projects. It also provides practical experience of underwater search methods and the use of buoyancy to lift objects. Search and Recovery SDC covers DO4 in the Dive Leader syllabus and this element can be signed up after the course. This course is open to BSAC Sports Divers or acceptable alternative. Your course pack includes all the learning materials you need for the course. The pack includes the Search and Recovery course manual and a Qualification Card application. In addition there may be other fees associated with the practical elements required to complete the qualification such as dive fees, accommodation, entry to inland dive site etc. Where possible these costs will be determined prior to the start of the course. Your course pack includes all the learning materials you need for the course. The pack includes: ‘Ox-Stop decompression tables’ (plus ‘Nitrox tables’ unless already BSAC Advanced Nitrox Diver), the ADP course manual and a Qualification Card application. £66.00: fee includes cost of training pack A (includes Nitrox tables). £51.00: fee includes cost of training pack B (excludes Nitrox tables). In addition there may be other fees associated with the practical elements required to complete the qualification such as the cost of gas, dive fees, accommodation, entry to inland dive sites etc. Where possible these costs will be determined prior to the start of the course. A two-day classroom and practical course that will teach you the basic techniques of marine navigation including how to locate a dive site. This will ultimately help you plan and manage dives undertaken by BSAC branches in any type of boat. The course focuses on the techniques of chartwork, position fixing and navigation and goes hand-in-hand with the practical Boat Handling course. In addition there may be other fees associated with the practical elements required to complete the qualification such as RIB fuel, accommodation etc. Where possible these costs will be determined prior to the start of the course. This session is designed as an introduction to underwater photography for people with little or no experience and teaches the basic use of digital cameras and housings. Run over one evening, the course involves a short dry theory/practical session followed by practical session in the pool. You are advised to bring your own underwater camera if you have one. If you have a digital camera but no housing, you may find it useful to have it to hand during the theory session. This course is open to BSAC Ocean Divers (or acceptable alternative). Because of the task loading imposed by using an underwater camera and the risk of damage to sensitive marine life, it is recommended that before attempting underwater photography in open water conditions, students should be able to control their buoyancy within ±1m or better, and that they should be very familiar with their own diving equipment. There are no learning materials with this course. £10.00. This is a classroom/pool-based session so no other expenses will be incurred. This session takes place over one evening and will introduce attendees to the silent world of rebreather diving. A short theory session is followed by a practical session in the pool where you will get the chance to try out an AP Valves Inspiration CCR unit under the supervision of experienced CCR diver instructors. This course is open to BSAC Sports Divers (or acceptable alternative), you will need a minimum of 50 logged dives and hold a BSAC Advanced Nitrox Diver qualification or above (or acceptable alternative). Don’t know your bowline from your sheet bend or your clove hitch from your square knot? This informal session takes place over one evening and will teach you everything you need to know about knots, bends and hitches. With rope work being so important to divers and boat handlers alike, this fun course is invaluable for any club member. This course is open to BSAC Ocean Divers (or acceptable alternative). This informal course is run over one evening and is great for divers that own their own equipment or look after their club’s kit. The course acquaints you with the maintenance requirements of modern diving gear. It also distinguishes between what maintenance the owner may safely undertake and what should be left to a trained repair technician. The course covers typical problems and has a mixture of lessons and hands-on sessions so you can practice and develop your new skills. This course is open to BSAC Ocean Divers or acceptable alternative. This session, run over one evening in the pool, is recommended for anyone who has recently attended a BSAC Instructor Foundation Course (IFC). Building on the skills taught at the IFC the workshop covers all aspects of practical teaching in the pool in even greater detail. This course is open to BSAC Sport Divers or who have attended the BSAC Instructor Foundation Course.